Since the advent of the rule of Brahmin for centuries (in India), the Shudras and the Ati-sudras are suffering hardships and are leading miserable lives. To draw people’s attention to this, and that they should think over their misfortune, and that they should eventually set themselves free form this tyranny of the Bhats (Brahmins) perpetrated on them – is the main aim of (writing) this book. More than three thousand years may have elapsed since the advent of the rule of Brahmins in this land. They came to India from a foreign land (they were aliens to India), and they subjugated the original inhabitants of India and perpetrated a vile tyranny over them. When they realised that the original inhabitants had forgotten all about this, the alien Bhats (Bhramin) skillfully managed to hide from the natives the true state of affairs (having conquered them and turned them into helots). In order to impress them with their own superiority, the conquerors devised many ways to perpetuate their own interests by various ways. Unfortunately, all of them succeeded in their objects, because the original inhabitants were already a conquered race, and were kept in perpetual darkness by being deprived of (the light of) Knowledge by the Brahmin, That is why the poor people could not understand their conqueror’ wiles and guiles. In order to overpower the and to keep them thraldom for ages, they (the Aryans) produced many spurious religious tracts and claimed to have received them directly from God as revelations. The poor ignorant folk were persuaded to swallow this lie. They further concocted many legends in their (divine) books to the effect that the conquered people should serve the usurpers faithfully so that God would be pleased, and that the main object of creating the depressed people was serving the usurpers faithfully which would be a consummation devoutly to be desired, as per ‘divine dispensation’. They highlighted this fiction in their spurious tracts. Even a cursory and causal acquaintance with these spurious tracts is enough to explode the myth of their divine origin. Even to out clever Bhat-Brethren (whom we are ashamed to term as ‘brethren’) the writing of such spurious tracts brings great things, and Who has the same love and regard for all creation. Even our so-called learned Bhat (Brahmin) brethren would gladly acknowledge this. We are ashamed to own them as our’ brethren’ because they oppressed the down-trodden greatly at one time, and even now we are labouring under great disabilities in the name this ‘so called religion’ and it is a universal truth the fraternal religion has no place for mutual oppression. We are forced to own them as our ‘brethren’, being the children of the same Creator. But the usurpers should not think only of their own selfish interests but must think in a just and fair manner. Wise English, French, German, American and other scholars will surely opine that these religious books (produced by the Brahmins) are spurious because they try to impress upon the people’s mind the greatness of the Brahmins by palming off the fiction that the Brahmins are superior even to the omnipotent Creator Himself.. Some English authors in their historical treatises have already expressed their view that the Bhat authors have enslaved the `natives’ in order to promote their own interests. Little do the Bhat authors realise how they have belittled and demeaned the splendour and majesty of God through their mean productions! God has granted the freedom to all people (including the depressed and down-trodden) to enjoy equitably all things created on this earth(animate and inanimate). But the Bhat authors have concocted spurious tracts in the name of God, dispossessed the common people of their legitimate rights, and assumed a pre- eminent place (in the hierarchy of society) for themselves. Some of our Bhat brethren may well ask at this point, ‘supposing these religious tracts were spurious, how did the forebears of the depressed and down-trodden believe in them and how do some of them continue to believe in them even now?’ The simple answer to this is as follows: In these modern time when we have the freedom to speak out (or express) in writing our thoughts freely, if a deceitful person were to take a letter purporting to be from a respectable person to a wise person, even if that letterbe spurious, the wise person tends to believe in it for the time being and thus is duped for the time being. The depressed and down trodden who were kept ignorant by the Bhats, being caught in their shrewd trap, were deceived and were made to believe in the spurious religious books, stating loudly that they were in their best interests. The Bhats are deceiving the ignorant folks even now. This deception practised on the simple folks is of a piece with the deception described above.. (This practice stands to reason). There is nothing to doubt this nefarious practice. The Bhats in order to feather their own interests tender advice to the ignorant down-trodden people time and again. That is why the poor people begin to respect the (so-called learned) Bhats. By this means the Bhats have compelled the Shudras to accord honour to them which is really due only to God. This is a great injustice indeed! Surely, the Bhats will be answerable to God Himself. So deep has been the impress of the deceitful teachings of the Bhats on the minds of the Sudras, that they were prepared to oppose (fight) the very people who were trying to free the shackles imposed on them by the Bhats. (This is exactly the way the Negroes in America reacted to those kind souls who tried to free them from the bonds of slavery). They are not content with telling their benefactors’ “Do not try to oblige us. We are quite content with our present lot (of Slavery)”, but go a step further and pick up quarrels with them. It is a very strange thing indeed! Be it noted that the benefactors of the ignorant folk do not stand to gain anything by their noble action. On the contrary, some of them have to sacrifice their lives, and also to endanger their own safety and interests. Why are they actuated by these philanthropic urges? A little introspection will tell us that `freedom’ is imperative to man, and it is the duty of every gentleman to bestow this freedom on those who are deprived of it. When a man is free, he is able to express his innermost thoughts orally or in writing to others. Even important beneficial thoughts cannot be communicated to others for want of freedom (of expression) and thus they evaporate in course of time. The Creator of this world, Who is also Omnipresent, has conferred some precious human rights upon all mankind (all men and women). But the selfish and cunning Brahmins have kept the people in the dark about their human rights. A truely liberated man will never hesitate to demand these human rights from his oppressors for himself. Due rights confer happiness on people. The philanthropic people are inspired to confer freedom on every one and then to make him happy by releasing him from unjust oppression. They reck not the dangerous risks involved in such work. How noble and philanthropic is such work! As their objects and aims were noble, God crowned their efforts with success wherever they strove to this end. We pray to God to shower His blessings on their noble efforts. May they prosper wherever they strive in this good cause! The nefarious practice of capturing poor people and enslaving them has been in for many centuries in the continents of Africa and America. Some advanced nations (people) in Europe and elsewhere were genuinely ashamed of themselves for this heinous crime. Many liberal minded souls in England and America tried hard to abolish this bad practice by waging wars against the oppressors. They cared not even for their own safety or interests. Many slaves were cruelly separated from their own kith and kin (parents, brothers, sisters, offspring and friends) and thus were passing through hell-fires. As a result, they pined away and were on the point of death. Just then they were reunited to their dear and near ones (through the kind ministry of these noble souls). All praise to those selfless American reformers for their noble deeds! But for their kind efforts and ministration, the unfortunate slaves would have died without being united to their kith and kin. Were those who enslaved them treating them humanely? No! No! A recital of the cruel ways will wring tears even from the stony hearts. The slave-owners used to kick them routinely as if they were brutes. Sometimes they used to yoke them to the ploughs and make them plough their lands in the burning sun. If they shirked a bit, they were whipped mercilessly. They did not care to feed them properly. Many times they had to starve. The meager food that was served to them was most unsatisfactory and insufficient for their needs. Sometimes even this was not served to them. The slaves were compelled to put in hard work throughout the day till they broke down completely and were condemned to the stables for their nightly rest. They would lay down their tired limbs on the insanitary floors of the stables half-dead. Even the sweet balm of sleep was denied to them. How could they sleep there? They were in terror of the call of the slave-owner at any time (in the night). Sleep eludes empty stomachs. Their bodies used to ache from the whiplashes rained on them by day and they tossed from side to side. To make matters worse, the very thought of their dear and near ones from whom they were so cruelly torn apart wrung ‘tears of molten lead’ from their tired eyes. In this helpless plight, they used to pray to the Almighty to take pity on them and to deliver them from this hell on earth. ‘This is unbearable! Please send Thy angel of Death to us and deliver us’ they prayed. Thus they passed the miserable hours of the night. Words fall short to describe their agonies, miseries and hellish torture! The good people of America have abolished this pernicious practice of slavery prevalent there for centuries and have freed many poor slaves from the clutches of the slave owners’ tyranny. The depressed and down-trodden people of India feel specially happy at this suspicious development, because they alone or the slaves in America have experienced the many inhuman hardships and tortures attendant upon slavery. The only difference between these two categories of slaves is this: former were first conquered and then enslaved, while the latter were captured (in Africa) and were enslaved in America. The miserable condition of both types of slaves is identical. The hardships heaped upon the slaves in America were also suffered by the depressed and down- trodden people in India at the hands of the Bhats, Nay, even more! A mere mention of their cruel hardships will break the hearts of even the stony hearted. Streams of tears will burst forth from within the black hard rock (granite) which will inundate the whole earth. It will appear as a veritable ‘deluge’ to some of the descendants of the Bhat brethren, who dehumanised the Shudras, if they possess some modicum of humanity — so glaringly different from the other segment of the same fraternity. If the British (rulers) conduct an impartial inquiry into the true state of affairs regarding the Shudras, they will get a clear idea about the tortures and tribulation heaped upon the Shudras (the depressed and down-trodden) by the Bhats, and will be convinced that important chapters from the history-books of India written so far have been deleted. A correct perception of the miseries suffered by the depressed and down-trodden people is bound to affect their literature also. The history of the Shudras (of India) will be very valuable as a portrayal of the inhuman conditions to which these Shudras were condemned for centuries by their wicked oppressors. The tender-hearted (poet) will be shocked beyond words. Out of evil cometh good! Poets so far had to invent imaginary episodes to create genuinely tragic emotions (in their readers). The poets will now be spared that exercise in view of the tragic conditions of the Shudras. If the foreigners are so grief-stricken over the miseries suffered by the Shudras of India, how much be the magnitude of the mental torture experienced by the present descendants of the original Shudras (of India) at the thought of their forefathers’ miseries. A mere remembrance of the inhumanity practised on the Shudras by their masters (the Brahminical autocracy) makes the hair stand on end. And we instinctively feel that if only the remembrance of their misery causes such sorrow to us, what hellish fires must the victims have gone through themselves! How Parashuram, the chief (executive authority) of the Bhats of India persecuted the original inhabitants of India – The Kshatriyas (the warrior class) will be described in due course in this treatise of ours. He massacred the Kshatriyas and deprived their poor womenfolk of their babes in-arms and perpetrated `the massacre of the innocents’! He went one step further. He hunted down the pregnant wives of the Kshatriyas who were running helter-shelter to save themselves as also the babies in their wombs, and captured and imprisoned them. If they delivered baby- boys, Parashuram would rush there and kill the new – born. It is futile to expect to get a factual and impartial history from the Bhat persecutors of the Kshatriyas. Bhat historians may have deleted this sinister chapter form their history books as nobody likes to own up his wicked deeds. Still it is very surprising that some of their (chroniclers) have recorded this despicable episode in their historical works (such as they are)! Even a cursory glance at the account of the inhumanity perpetrated by Parshuram saddens out hearts even today. What agony must the pregnant mothers have gone through when they were pursued by Parashuram (and his hordes). Women are not expert runners (are not use to running). Some of them who were the consorts of noblemen were used to spend their days, confined to their homes. The pregnant women who led luxurious lives under the protection of their husbands till then, should have been forced to run for their lives (to protect the babies in their wombs) is the height of misfortune! Some of them may have tripped and dashed against rough stones on the moor (being unused to run outdoor). They must have sustained bodily injuries (on their elbows, foreheads, knees etc.) and bled profusely, but the fear of the relentless pursuer — Parshuram — would not let them rest. Their soles must have been pierced by thorns, their clothes torn, and their bodies bruised by the brambles – resulting in inevitable blood-letting. The exertion of running in the fierce heat of the sun must have scorched their feet and also their tender (lotus-like) complexions. They may have foamed at the mouth and their eyes brimmed with salt tears. Not having obtained even a drop of water for days on end, their stomachs must have turned sorely. They may have prayed that the earth should (split) open and swallow them up (as in the case of Sita) to save themselves from their relentless pursuer, ‘O Lord! why hast Thou brought us to this pass? ‘, so may have prayed some of them. `Defenceless that we are, we are still more defenceless in the absence of our husbands. Why do you prolong our agony? O Omnipotent Lord! Why have You become a silent spectator when we are being butchered by this friend, who has murdered our husbands and is now persecuting us?’ Parashuram may have captured and carried away some of them as they prayed as above. Some of the women may have entreated him humbly, while others may have breathed their last in anguish and in pain. They may have entreated Parashuram to spare their unborn babies. “We beg of you, on bended knee, (this favour). You may kill us but at least spare our babies. You have rendered us hapless widows. We will not be able to bring forth any more children hence forth. We are looking forward to the birth of this last child. Why would you drown us in an ocean of sorrow by killing our foetuses? Please grant this favour to us who are like your daughters”. But these entreatise had no effect on the stony hearted Parashuram. When Parashuram (Kamasa-like) may have snatched their new-born from them, the mothers might have bent over them protectively and might have prayed to him to spare their young ones. But to no avail! (Our pen is powerless) to describe the tragic scene (of Parshuram robbing the mothers of their new-born). When he killed those children under their mothers’s noses, some of them may have beaten their breasts, some torn their hair, some may have ended their lives in sheer grief and some may have gone mad with grief and wandered abroad disconsolate, lamenting their irreparable loss. It is useless to expect from the Bhats a faithful record of this dark chapter in our history. The Bhats have brain-washed the depressed and down-trodden people to acknowledge Parashuram, their commander who had massacred hundreds of Kshatriyas and who was responsible for the miseries inflicted on their wives and children as the Omnipotent Creator of this Universe. It is indeed, a great marvel! The Bhats who came after Parshuram continued to torture the Kshatriyas still further, We shall allude later on in this treatise, how the Bhats used to bury alive Kshatriyas in the foundation of buildings. If a Bhat happened to pass by a river where a Shudra was washing his clothes, the Shudra had to collect all his clothes and proceed to a far distant spot, lest some drops of the (contaminated) water should be sprayed on the Bhat. Even then, if a drop of water were to touch the body of the Bhat from there, or even if the Bhat so imagined it, the Bhat did not hesitate to fling his utensil angrily at the head of the Shudra who would collapse to the ground, his head bleeding profusely. On recovering from the swoon the Shudra would collect his blood- stained clothes and wend his way home silently. He could not complain to the Government Officials, as the administration was dominated by the Bhats. More often than not he would be punished stringently for complaining against the Bhats. This was the height of injustice! Some may well wonder as to how the Bhats managed to crush the depressed and down-trodden people here even though they (the Shudras) outnumbered them tenfold. It was well-known that one clever person can master ten ignorant persons (e.g. a shepherd and his flock). Should the ten ignorant men be united (be of one mind), they would surely prevail over that clever one. But if the ten are disunited they would easily be duped by that clever one. The Bhats have invented a very cunning method to sow seeds of dissension among the Shudras. The Bhats were naturally apprehensive of the growing numbers of the depressed and down- trodden people. They knew that keeping them disunited alone ensured their (the Bhats’) continued mastery ever them. It was the only way of keeping them as abject slaves indefinitely, and only thus would they be able to indulge in a life of gross indulgence and luxury ensured by the `sweat of the Shudras’ brows. To that end in view, the Bhats invented the pernicious fiction of the caste-system, compiled (learned) treatises to serve their own self-interest and indoctrinated the pliable minds of the ignorant Shudras (masses) accordingly. Some of the Shudras put up a gallant fight against this blatant injustice. They were segregated into a separate category (class). In order to wreak vengeance on them (for their temerity) the Bhats persuaded those whom we today term as Malis (gardeners), Kunbis (tillers, peasants) etc. not to stigmatise them as untouchables. Being deprived of their means of livelihood, they were driven to the extremity of eating the flesh of dead animals. Some of the members of the Shudras community today proudly call themselves as Malis (gardeners), Kunbis (peasants), gold-smiths, tailors, iron smiths, carpenters etc, on the basis of the avocation (trade) they pursued (practised), Little do they know that our ancestors and those of the so-called untouchables (Mahars, Mangs etc.) were blood-brothers (traced their lineage to the same family stock). Their ancestors fought bravely in defence of their motherland against the invading usurpers (the Bhats) and hence, the wily Bhats reduced them to penury and misery. It is a thousand pities that being unmindful of this state of affairs, the Shudras began to hate their own kith and kin. The Bhats invented an elaborate system of caste-distinction based on the way the other Shudras behaved towards them, condemning some to the lowest rung and some to a slightly higher rung. Thus they permanently made them into their proteges and by means of the powerful weapon of the `iniquitous caste system,’ drove a permanent wedge among the Shudras. It was a classic case of the cats who went to law! The Bhats created dissensions among the depressed and the down- trodden masses and are battening on the differences (are leading luxurious lives thereby). The depressed and down-trodden masses in India were freed from the physical (bodily) slavery of the Bhats as a result of the advent of the British raj here. But we are sorry to state that the benevolent British Government have not addressed themselves to the important task of providing education to the said masses. That is why the Shudras continue to be ignorant, and hence, their ‘mental slavery’ regarding the spurious religious tracts of the Bhats continues unabated. They cannot even appeal to the Government for the redressal of their wrongs. The Government is not yet aware of the way the Bhats exploit the masses in their day to day problems as also in the administrative machinery. We pray to the Almighty to enable the Government to kindly pay attention to this urgent task and to free the masses from their mental slavery to the machinations of the Bhats. I am deeply beholden to Shri Vinayak Babji Bhandarkar and Rao Saheb Shri Rajanna Lingu for their continued encouragement to me in the writing of this treatise. 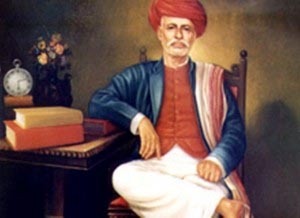 The term used by Mahatma Jotirao Phule was “NIRMIK”, which though literally meant “creator”, his concept of “nirmik” is entirely different from concept of God, Allah, or Ishwar etc. and it can be assumed that he did not believe in God in the usual sense.